Spc. 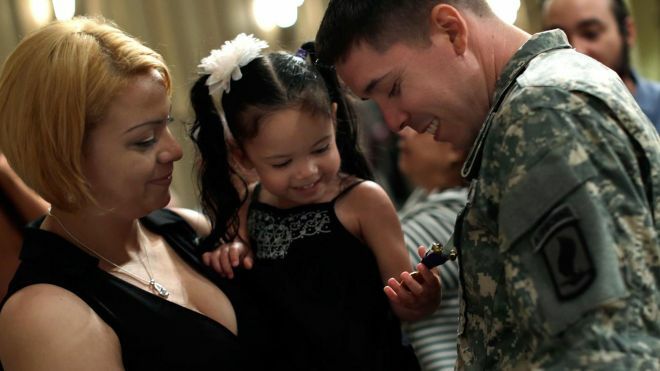 Arael Lopez-Lopez received the Purple Heart Monday for injuries received fighting in Afghanistan on his own birthday 10 months ago, Latino Fox News reports. Even though soldiers don’t necessarily go into war with hopes of coming out with a Purple Heart, Spc. Arael Lopez-Lopez was happy that in his case the award meant he could come home and reunite with his family. The 33-year-old Puerto Rican veteran received the honor Monday for the injuries he received fighting in Afghanistan on his own birthday 10 months ago. He is still under medical treatment for shrapnel remains in his head and back, as well as an injury that caused nerve damage to his left hand. The Purple Heart indicates meritorious military service and is awarded to service members who have been wounded during action against the enemy. On August 8, 2012, Lopez-Lopez recalled, he and his group of soldiers were heading back to the military base when they were attacked by Taliban insurgents in an exposed area. The attackers came from all directions, and the American soldiers had nowhere to run. He remembers that once a helicopter came to gather the injured, the insurgents redirected their gunfire to disable the aircraft, causing the chopper to leave the scene without two of its crew members – he was one of them. They had nowhere to go and became instant targets for two of the attackers. Fortunately the grenade did not impact him directly. Instead, it hit a house behind him and the explosion knocked him unconscious. Jennifer Lopez-Lopez, the soldier’s 27-year-old wife, said that she knew her husband was walking into the arms of danger by going to Afghanistan. She said that her husband would always call her before leaving on a mission and then again once he got back. On the day of August 8, the soldier’s birthday, she talked to him before the mission, but instead of getting the usual call saying he was OK she was contacted by the rescue team who told her the unfortunate news. The soldier said his experience in Afghanistan was a constant struggle because he and a small group of other soldiers were trying to help a village overrun by the Taliban in the middle of a mountain. The ceremony at which Arael Lopez-Lopez received his Purple Heart took place in Mount Vernon, Virginia. He said one of the highlights of the service for him was when they took a moment to remember the soldiers who made the ultimate sacrifice. The veteran described the ceremony as “amazing.” He said he was happy that he could share the experience with his wife, daughter, father, aunts and uncles. His wife said she was so moved by the ceremony that she was speechless. Previous honors awarded to Spc. Lopez-Lopez include a commendation medal, a National Defense Service medal and an Army Service Ribbon, among others. The soldier continues to receive treatment at the Walter Reed National Military Hospital and said he is healing well, but he thinks the treatment will continue for another eight to 12 months. He said he is still on active duty as part of the hospital brigade. Arael Lopez-Lopez moved from Puerto Rico to the United States in 2008. He and his wife have been together for the past four years and have a 2-year-old daughter, Yoselin. The family recently moved from Pennsylvania to Silver Springs, Maryland.